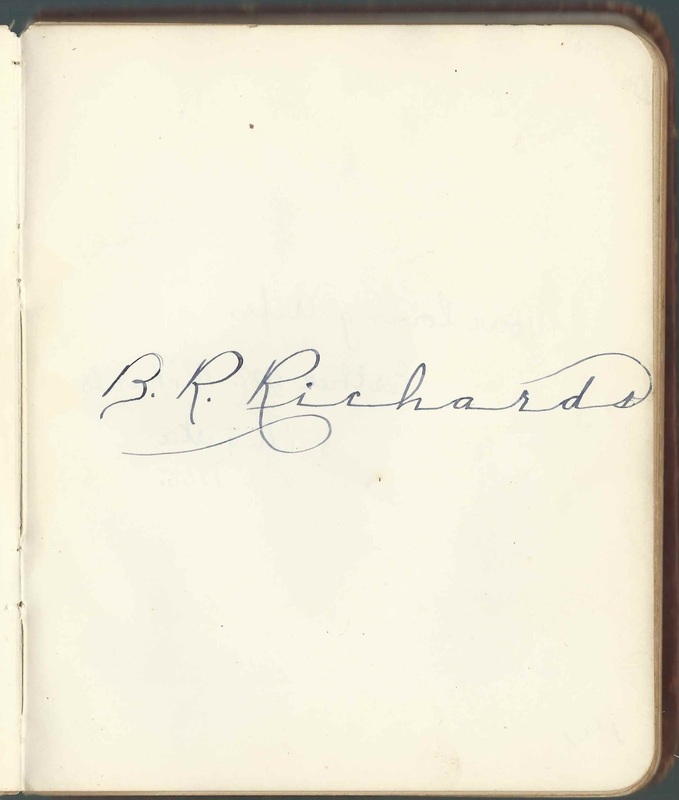 Autograph album of Benjamin Rose Richards of Hallowell, Maine, with entries from 1888 through 1907. 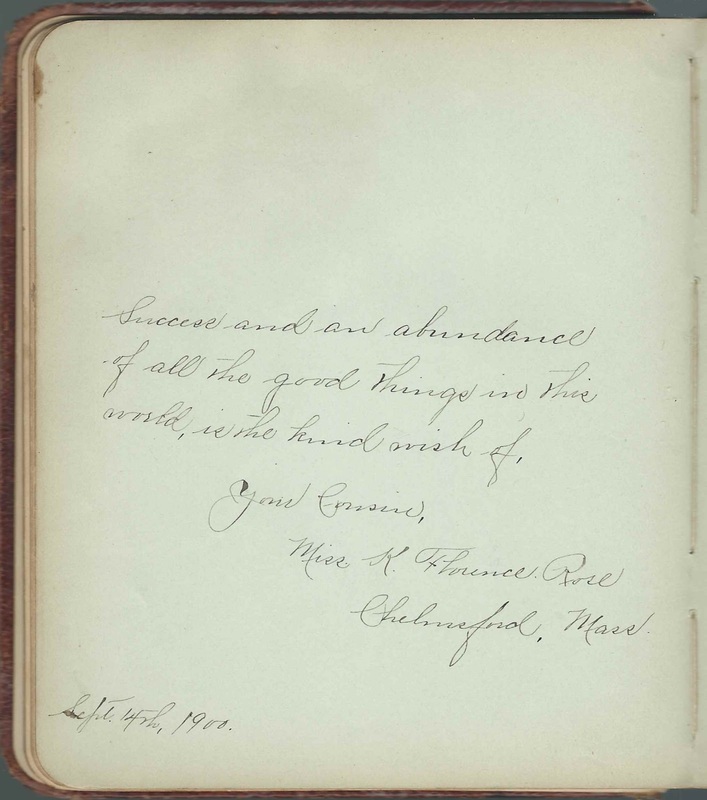 The album measures approximately 7-1/2" by 6-1/4" and contains the sentiments of 20 of Benjamin's relatives and friends. An alphabetical surname list and an alphabetical list of the inscribers, together with any personal information they offered, appear at the end of this post. Benjamin Rose Richards was born December 30, 1880, the son of Benjamin J. Richards and his second wife Ella F. (Rose) Richards [possibly Mary Ella F. (Rose) Richards], who married on May 7, 1879. 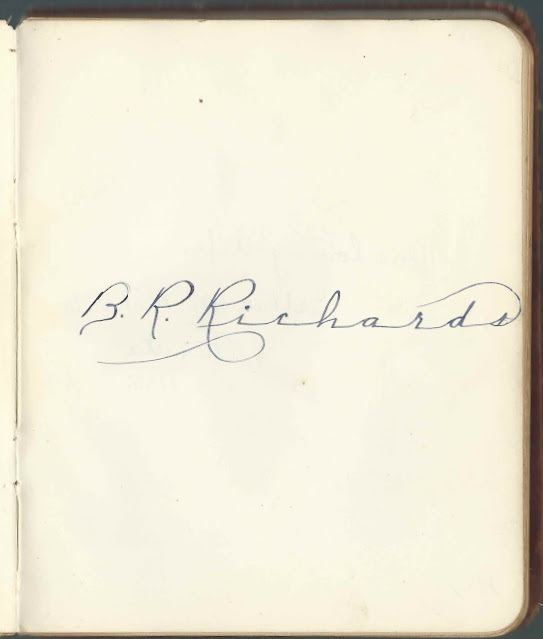 Benjamin J. Richards was previously married to Ellen (Spaulding) Richards, who died in 1877. A child from that union, Evie L. Richards of Manchester, Maine, inscribed a page to her half-brother on November 5, 1893. 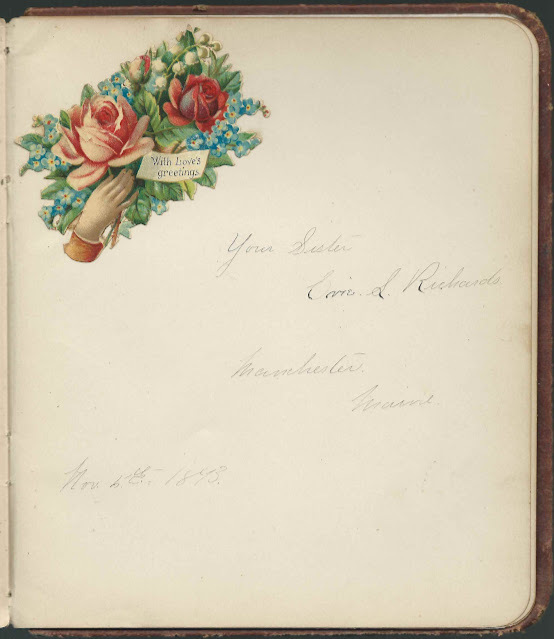 Benjamin Rose Richards' cousin, Katey Florence Rose of Chelmsford, Massachusetts, inscribed a page on September 14, 1900. Florence was the daughter of William F. C. Rose, who was, I believe, a brother to Benjamin's mother Ella F. (Rose) Richards. 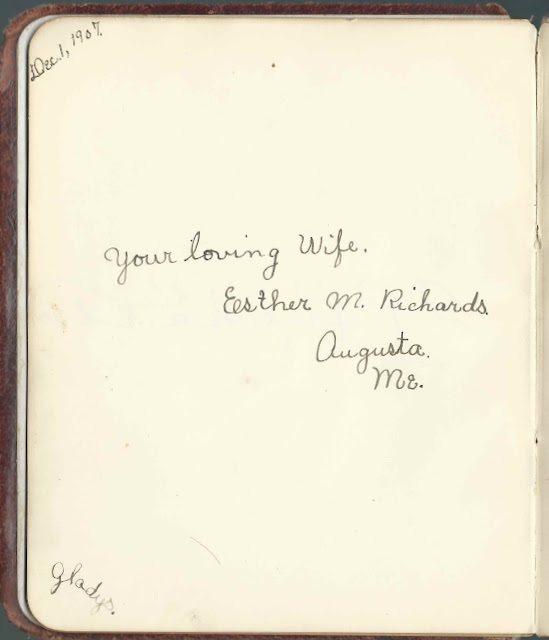 On October 29, 1904 at Augusta, Maine, Benjamin Rose Richards married Esther Marion Leavitt, daughter of Llewellyn Leavitt and Marion (Libby) Leavitt. Esther was born in July 1886. On their marriage record, Benjamin gave his occupation as expressman. 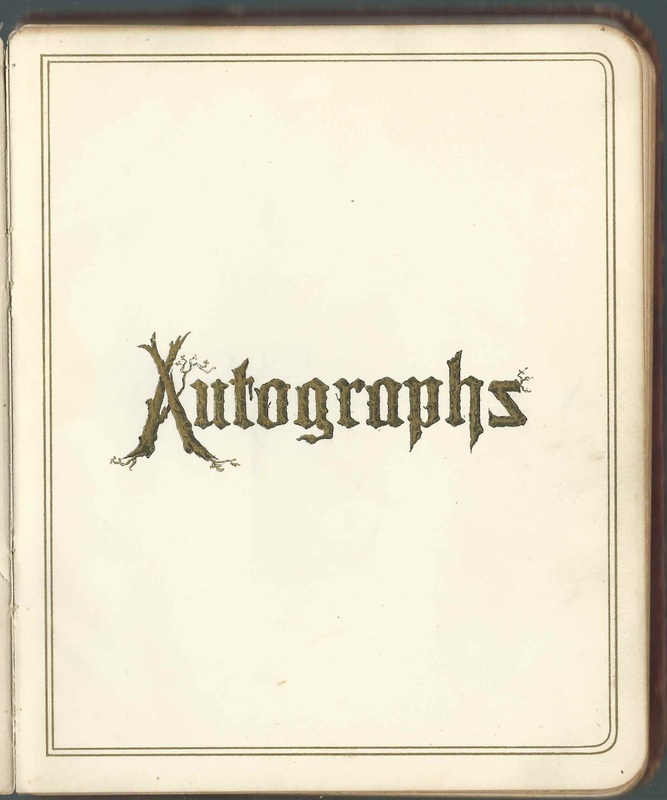 Esther inscribed a page in the album on December 1, 1907 and included the name of their first child, Gladys, in a corner. Esther died in what appears to be 1952 - there's an error in the text on her Find-a-Grave listing - and Benjamin died in 1957. They're buried in the Riverside Cemetery at Augusta, Maine, with daughter Doris (Richards) Barrett Higgins Donovan Cunningham, who died at the age of 100 at Auburn, Maine. Harry Gilson of Bawell, Maine [presumably Bodwell, Maine]; inscribed on March 11 [no year written]. Bodwell is a village in the city of Hallowell, Maine. Mrs. I. Frances Hosken of Hallowell, Maine; inscribed on January 24, 1900. 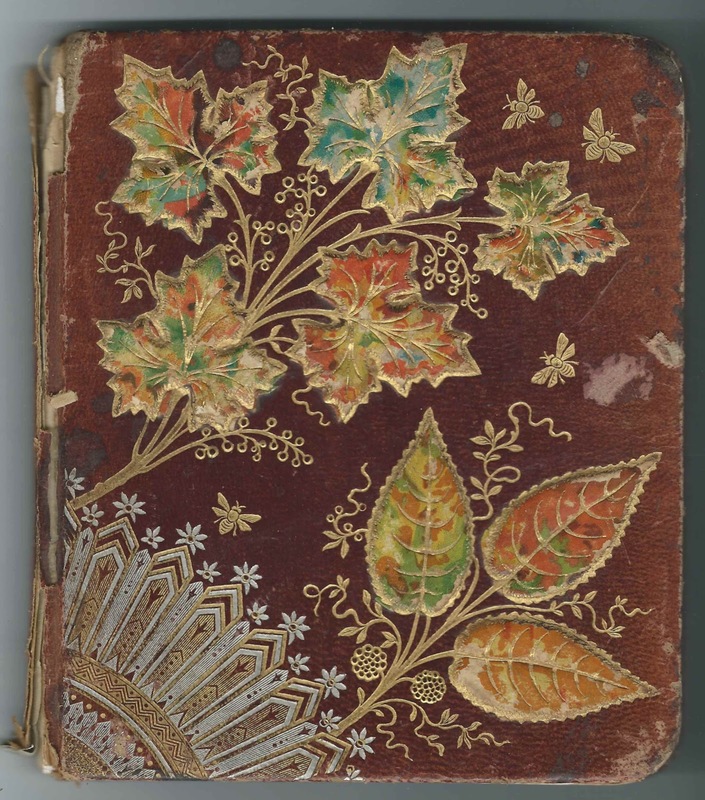 She was Ida Frances (Waterman) Hosken, whose husband William Hosken inscribed the left facing page. They married May 19, 1874 at Hallowell, Maine. 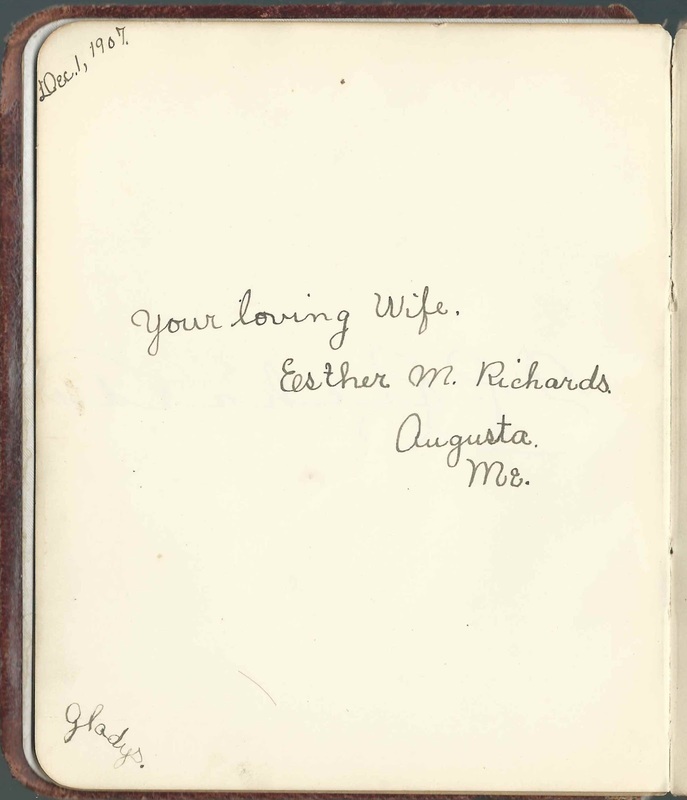 Esther M. Richards of Augusta, Maine; inscribed on December 1, 1907; "Your loving Wife". She was Esther Marion (Leavitt) Richards; she and Benjamin Rose Richards married at Manchester, Maine, on October 29, 1904. Esther wrote the name Gladys in one corner. Gladys Ella Mae Richards, their daughter, was born March 26, 1905 at Augusta, Maine. Evie L. Richards of Manchester, Maine; inscribed on November 5, 1893; "Your Sister". Evelyn Lizzie Richards, "Evie", was Benjamin Rose Richards' half sister, the daughter of their father's first wife Ellen (Spaulding) Richards, who had died in 1877. Evie would marry John A. Daggett in 1898. Susie Swift of Bodwell, Maine. Middle initial too ornate for me to decipher but she was presumably Susie G. Swift, whose siblings Blaine H. Swift and Jessie Mae Swift also inscribed pages. Bowell is a village in Hallowell, Maine. Jessie Mae Swift of Bodwell, Maine. Bodwell is a village in Hallowell, Maine. Edith A. Tregembo of Bodwell, Maine; inscribed on January 6, 1900. She wrote H.H.S. '99 in one corner; presumably Hallowell, Maine, in which Bodwell is a village. Edith Alice Tregembo was born about September 1882, daughter of William and Alice (Cubbin) and the wife of Everett Robinson Murch.